The Great Kinder Beer Barrel Challenge is ON again in 2019! Save the date: Saturday 14th September. Have you ever wondered what the residents of one of England’s most breathtaking areas get up to as each summer draws to a close? 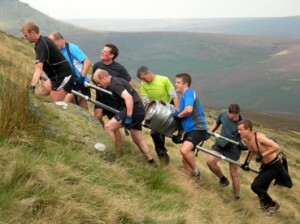 Some of them choose to haul a full seventy-two pint beer barrel up and across one of the toughest areas of high moorland in the Peak District National Park. The mountain known as Kinder Scout, scene of the famous mass trespass in 1932, plays host to one of the most gruelling fell-running events to be run on the Dark Peak hills. Find out about the history of this unique challenge, the teams that take part, and the landscape that gives it such a fearsome reputation.